We were done with our annual vacation for this year and with schools reopening 10 days back, attending my cousin's [sister] marriage back in India was next to impossible. Though very excited on hearing this good news I was feeling sad that we will be missing it. All relatives were excited to meet once again during her wedding ceremony [after my son's thread ceremony function] and each one of them noting their plans to make it memorable for her and her family, filled with fun and joyous moments. May you achieve the best that life can offer"
Wishing you both a lifetime of everlasting love and happiness !!! Making rawa laddoos and there are many ways. Some sprinkle warm milk to bind, some use more of ghee, some add dessicated coconut, some add camphor. But I was looking for recipe that uses sugar syrup, no coconut and less ghee. Working with sugar syrup solution is a tricky job. The last time I prepared sugar syrup, it was almost 10 months back for Pista fudge. So you see out of practice, but I still decided to go ahead with my memory and kept the confidence that I can do it. All over internet when I browsed through the recipes, it mentioned one string consistency where as the recipe shared by my friend JB was 1/2 thread consistency. According to her getting 1/2 thread consistency is very important step if you prefer to get soft laddoos. 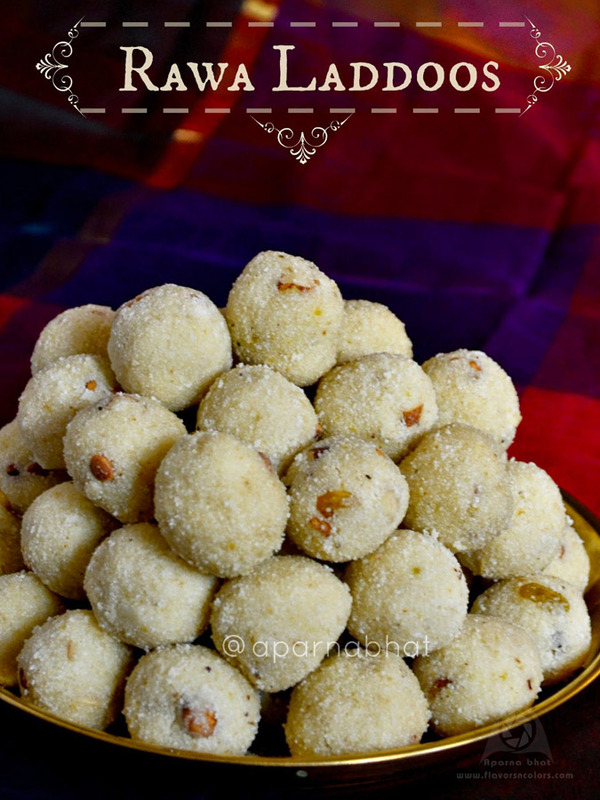 I began with thought of preparing soft laddoos and initiated the procedure following her recipe. But I guess I miscalculated the time to switch off the flame. It had passed 1/2 thread stage and may be nearing 1 thread consistency. The laddoos didn't turn out soft. But they were neither hard as stone :D. I shared these laddoos with few friends and they liked them. We enjoyed eating them popping one into our mouths every time we came across the sweet box on our dining table and the laddoos are gone, the box empty ! Heat ghee in heavy bottomed vessel/ nonstick pan. Roast nuts and raisins and keep them aside. Roast rawa in the same vessel/pan on low flame and roast it until it emits a nice aroma. [about 5-6 mins]. Switch off the flame and keep the roasted rawa aside. In another pan mix sugar and water [water just enough to cover the sugar] and heat it on low flame to prepare sugar syrup. Keep stirring and switch off the flame before it reaches one thread consistency. Add elaichi/cardamom powder and saffron. Next add roasted rawa and roasted nuts +raisins. Mix in well, it may look like a mess. But don't worry just cover the vessel for some time. The mixture will cool down and the consistency will be similar to that of dried upma. Crumble the mass and then start binding the laddoos. Continue until you finish the mixture. Store in air tight containers. These sound so good! They remind me of one of my favorite Christmas cookies. So sorry you didn't get to attend your sister's wedding, I'm sure she knew you where there in spirit.